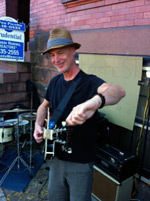 Todd Nelson is a guitarist who has recorded or performed with Terry Adams (NRBQ), Gary Burke (Dylan Joe Jackson), Hayseed, Aimee Mann, Ed Mann (Frank Zappa), Rumdummies, Pal Shazar, Jules Shear, The Wheelers and Dealers and others. He was a founding member of Fear of Strangers (aka The Units), a band that was an integral part of the Punk/New Wave scene in the Capital District of New York in the 1980s, releasing an album on Miles Copeland's Faulty Products label. The band shared stages with the Police, Squeeze, the B-52s, XTC, Iggy Pop and others around the Northeast. Todd is currently recording and performing original songs and arrangements for his instrumental trio, featuring Kyle Esposito on fretless bass and Manuel Quintana on drums and percussion, both of whom are featured on his first CD release, "Here".